Protesters hold a banner (C) which reads “March For Democracy in China” as they take part in a march in Hong Kong on May 27, 2018 to commemorate the June 4, 1989 Tiananmen Square crackdown in Beijing. 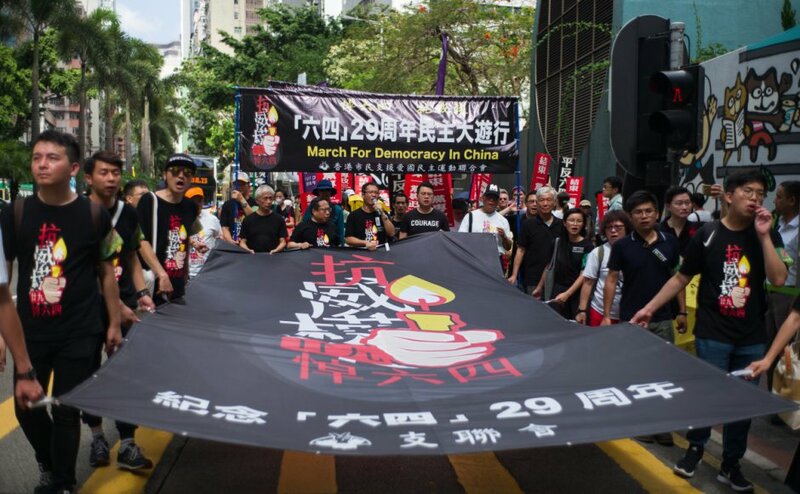 Hundreds marched through Hong Kong on May 27 ahead of the 29th anniversary of China’s crackdown on democracy protesters in Beijing’s Tiananmen Square. (TibetanReview.net, May29, 2018) – Up to 1,100 people were reported to have taken part in a rally in Hong Kong on May 27, calling for an end to one party dictatorship in the People’s Republic of China, ahead of the 29th anniversary of the Jun 4 Tiananmen Square massacre in Beijing, reported the AFP May 28. The demonstrators marched from Southorn Playground to Beijing’s liaison office in Western district. There, they queued to place “end to one-party dictatorship” stickers outside the gated complex amid a large police presence, the report said. The slogan was reported to be the subject of recent debates after a former Chinese official in charge of Hong Kong’s affairs had suggested that any mention of it was against the law, with those using it risking disqualification from local elections. But Albert Ho Chun-yan, chairman of the Alliance in Support of Patriotic Democratic Movements of China, the march organizer, has said the group would not abandon the slogan as “only with the end of one-party rule could a democratic China be realised”. “I don’t think there is any legal basis to what these people say, but we are willing to face whatever consequences there are,” Ho has said. Participants in the march were reported to have called for the release of human rights activists, and accountability over Beijing’s bloody crackdown on a pro-democracy sit-in at the heart of the capital on Jun 4, 1989. Many were reported to have also called for the release of detained human rights lawyers and activists, including Liu Xia, widow of the 2010 Nobel Peace Prize laureate Liu Xiaobo, and Wang Quanzhang, who has been missing on the mainland for more than three years. The exact death toll may never be known, but hundreds, perhaps more than 1,000 peaceful Chinese demonstrators, are believed to have been killed by the People’s Liberation Army, the report said. The special administrative region of Hong Kong is the only city on Chinese soil where annual commemoration of the crackdown has been tolerated. A candlelight vigil is held on the night of Jun 4 every year in Victoria Park. The marchers had dwindled since 2015, when 3,000 people took part, the report noted. However, the turnout for the alliance’s annual evening candlelight vigil at Victoria Park on Jun 4 generally draws a larger turnout than the march, it added.